During this 2017 UN Year of Sustainable Tourism, we have already shared many stories of environmental and social sustainability in the HI Hostels. Have you seen the stories of CO2 emissions reduction on our April blog post? Or maybe you felt inspired by the community projects we discussed in July? This month’s topic centres on economic sustainability and how we can ensure development and fair profit for our global network of hostels. Read on to hear about how our hostel network is already implementing economically sustainable projects and how you personally can help out while you are travelling! HI Hostels around the world have made a great contribution to social and environmental issues through their on-going, dedicated mission-based programs and activities. However, no great initiative can ensure long term survival without being financially sustainable. As the pioneers of the hostelling movement we know that resilience is the key to maintaining, strengthening, and continuously developing our network. Our mission lies at the core of our hostels, which are designed to facilitate social mobility for everyone, and intercultural exchange. Hostels need to be welcoming and receive enough guests to cover their costs and hopefully be able to invest in further projects and sustainable initiatives. As a non-for-profit organisation, we need to ensure fair profit to allow investment in continuing to deliver our mission. What do we mean by fair profit? To keep our charity status, we follow rigorous legal and financial standards to ensure all requirements are fulfilled. By booking through hihostels.com, you are helping us to continue supporting the hostelling mission which promotes sustainable tourism through various ongoing projects, activities and events. Just have a look at some of the great projects happening in the HI Network by checking out our monthly blog posts already posted this year. 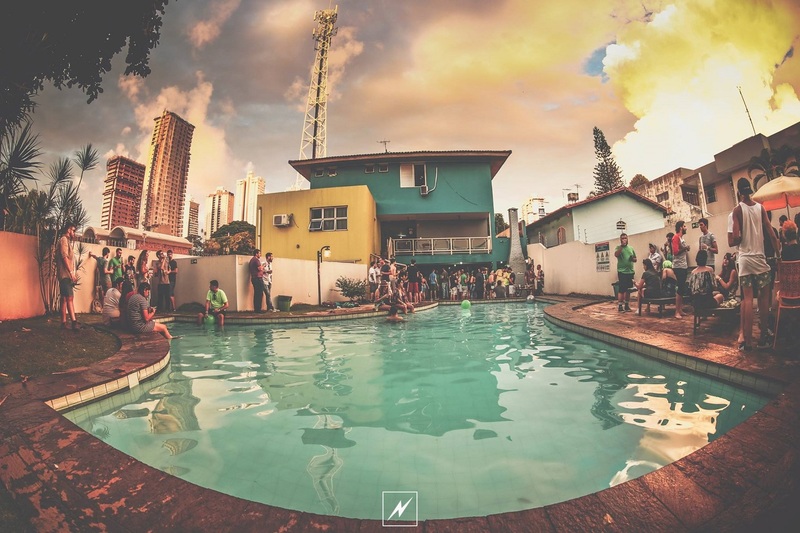 How can HI Hostels create fair profit and network development? 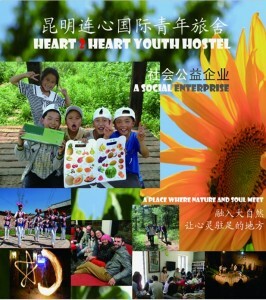 Heart 2 Heart Youth Hostel is a social enterprise under the auspices of Yunnan Heart to Heart Community Care. Its mission is to promote sustainable living practices, social and service learning, eco-farming, healthy eating, love, and care of the countryside and animals. The ultimate objective is to achieve community development among the ethnic minority groups in the area. More than this, the hostel’s vision is to build a harmonized community by means of local participation through hostelling, eco-farming, and agricultural business. How cool is that? YHA E&W believes travel, adventure, and discovery transforms young lives by creating opportunities to explore, learn, share, and grow in inspirational places. 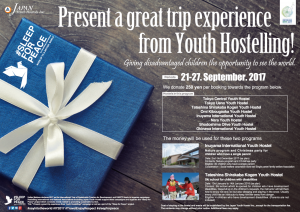 Through new experiences in the Youth Hostels, young people learn about themselves, each other, and the world around them. As a result, they grow into happier, healthier, and more successful adults. Check out this great summary of YHA E&W’s Impact on improving young people’s health, education, and recreation — way to go, YHA E&W! Become a HI Member. Not only will you get 10% off the price of your stay, you’ll also get access to many HI Membership benefits and discounts. The best part is that by joining HI, you become a member of a global community of like-minded travellers, and will help to support HI Mission-based events and activities. Make sure you start a conversation about quality and sustainability. Talk to the hostel staff and volunteers about their initiatives, your feedback will be very valuable. You may even end up wanting to volunteer yourself! 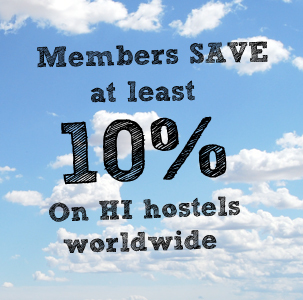 Donate to the HI Sustainability Fund when you book one of our hostels. Even as little at £0.10 adds up to help us continue supporting innovative projects that aim to reduce CO2 emissions. Not only do the projects financed by the HI Sustainability Fund help our hostels to reduce their carbon footprint, but some also contribute to changing the lifestyle of communities in developing countries by providing them with, for example, sustainable cooking stoves or education, and giving them access to less polluting energy sources! 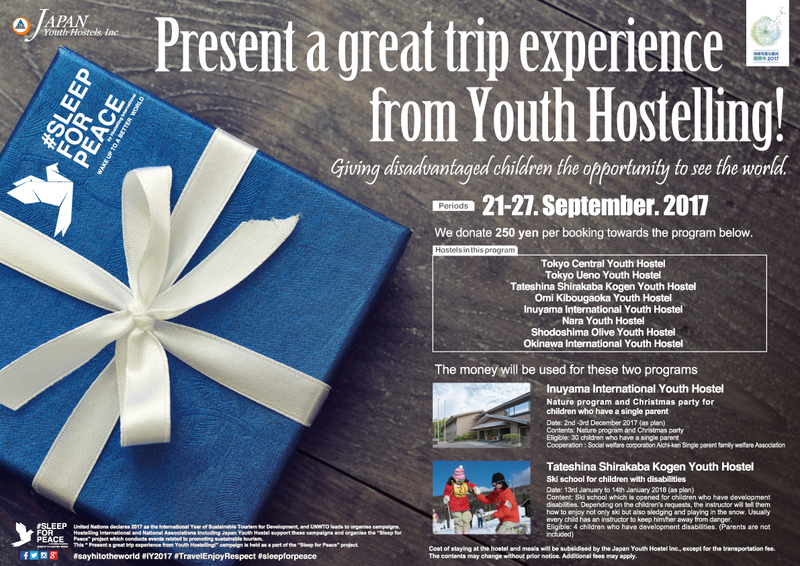 Are there events and activities going on during your stay in the hostel? Take part! You will be helping to make a positive impact on the sustainability of hostelling. A fantastic example of a HI Mission-based event is Sleep for Peace, a week-long program starting on the UN International Day of Peace (21st of September) and finishing on World Tourism Day (27th of September). The initiative aims to unite people, celebrate diversity, and promote peace through activities in our network of hostels. Parties, concerts, conferences, themed tours, and more will be happening around the globe! Join the Facebook group to keep up to date with the programme and stay tuned on our blog to hear more about how you can get involved in these events from 21-27 September! What can our hostels do? Create win-win partnerships in the community and offer HI Membership discounts to their guests. Check out, for example, our partner Urban Adventures! Their mission is all about supporting local communities through revenue share and collaboration with local guides, transport companies, restaurants, etc. Plus, HI Members get to enjoy 15% off their tours! Choose like-minded suppliers that help make a difference in their communities and complement HI’s Sustainability Strategy and approach. Work towards achieving the HI-Quality (HI-Q) and HI-Quality and Sustainability Management (HI-Q&S) system to improve your hostel’s daily processes, as well as social and environmental standards. And once you get certified, don’t be shy to shout from the rooftops about it and spread the word! Make sure you communicate your achievements and walk the talk in all your promotional materials. Have a plan in place and budget allocated yearly (at least) to maintain the hostel building, major equipment, and inventory. The plan should take into account the weaknesses of the building as well as the HI Sustainability Charter. Organise mission-based activities and take part in the HI Global campaigns such as the celebration of the UN Year for Sustainable Tourism, Sleep for Peace, and submit your projects to the HI Sustainability Fund yearly. Measure your staff and customers’ satisfaction and be on top of their requests – their happiness is your happiness. Even more, measure your impact like YHA E&W are doing above! Do you now feel encouraged to start a conversation about financial sustainability? Have you seen any great examples during your travels in hostels? Let us know your thoughts about this topic in the comments below!